When very talented musicians in their own right get together and form a band, the chances are it is going to be good. When Oli Brown, Aaron Spiers and Kev Hickman got togther to form RavenEye it wasn’t just good, it may be the best thing you have ever heard. See them play live and you soon become addicted to their phenomenal sound. Having recently played in Sheffield, it was another trip up the M1 to Fruit, which was based in the old fruit market by the marina in Hull and although the venue was a bit cold to begin with, the place soon warmed up when RavenEye brought their own style of music to the North. When the words “Hey you, what you waiting for, hey you, let’s get it started” were sung on the opening song, it was one of those hell yeah moments as they kicked off the evening with ‘Get It Started.’ It has everything you would expect from rock and more, a soaring guitar solo, a heavy rhythm and an anthemic sound. However it is their debut single ‘Breaking Out’ that takes things to another level. With a dirty bass line, pounding drums and the filthiest guitar riff in the history of rock, once you add in the powerful vocals, this is a song that was born to be played live. Even ‘Run Away’, a song which is slightly softer in tone, has an catchy beat to it. With Oli checking “Are you all having a good time?”, it was new song ‘What Else’ that had one those spine-tingling moments, when the vocals soared through the chorus. Introducing the next song as being about pleasure and those vices that maybe aren’t so good for you, ‘Hey Hey Yeah’ is so infectious sounding it compels you to move, as Oli got the crowd to sing along with the chorus. Enjoying playing the set as much as those there watching them, smiles were constantly exchanged across the stage, and as Oli and Aaron moved towards Kev on the drums to form a circle on the guitar breaks, you felt there was a connection between the three that goes beyond just sharing a stage. This is what the music should be all about, having a great time, playing excellent tunes, entertaining the crowd and the band excel at all three. ‘Home Sweet Home’ brought a softer side to the evening, with its more delicate guitars and delicious harmonies, before they once again picked up the pace, with Oli shouting “Let’s go crazy” and ‘You Got It’ was just the song to do that. With more of that signature RavenEye rock, Oli climbed on to the kick drum, the entire band tore up the stage and this ended what had been a dynamic set from them. With Kev coming back on stage and asking “Do you want one more?” to the surprise of the other band members that he actually spoke for once, and after a small amount of teasing that was all taken in good humour, it was left to ‘Love Is Taking Its Toll’ from Oli’s solo live album to end what had been an electrifying set from the band. With the band taking a final bow to cheers from the crowd, the night had been a resounding success. 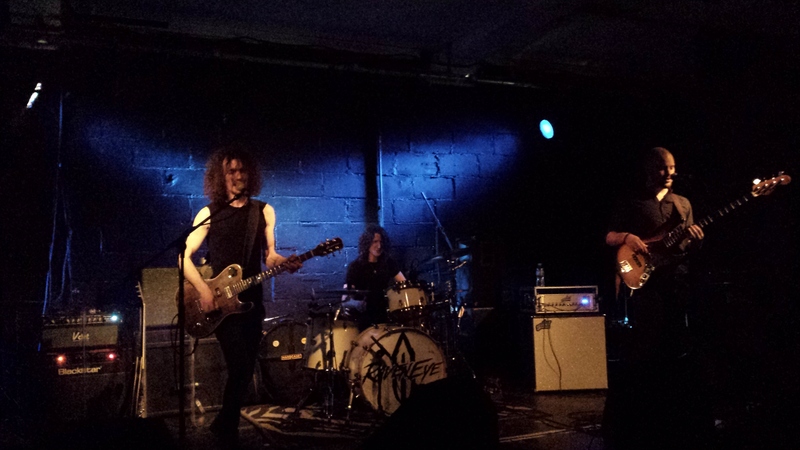 RavenEye are all about the rock and in Hull they damn well proved it.